Splash pages, you gotta love 'em. A blank canvas where the artist can hit you with a large dose of illustrated 'wow'. 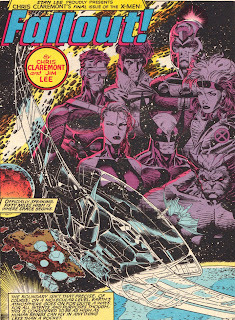 This week, with NYCC unveiling plenty of major news stories, I thought I'd grab a splashie from a milestone comic, the (at the time) final issue of writer Chris Claremont's historic run on X-Men. Pencilled by Jim Lee, I wanted to stick up the uncoloured version first, just to show how magic it is. Did you know that according to Amazing Heroes #188 the original line-up for the 'blue' team, was Marvel Girl, Storm, Beast, Wolverine and Gambit? While the faces of Magneto and the finalised blue x-team make a cosmic splashie, it is a little sad X-Men Vol2 #3 couldn't start with a montage of all Chris's favourite characters - like Storm and Shadowcat - especially since the issue contained a major X-Man vs X-Man throw down! That splash page looks extra stunning in black and white, more so than in colour. I reckon so too Karl, it really pulls out the detail. I almost wish all comics were printed in just Black and white. (Sorry colourists)! 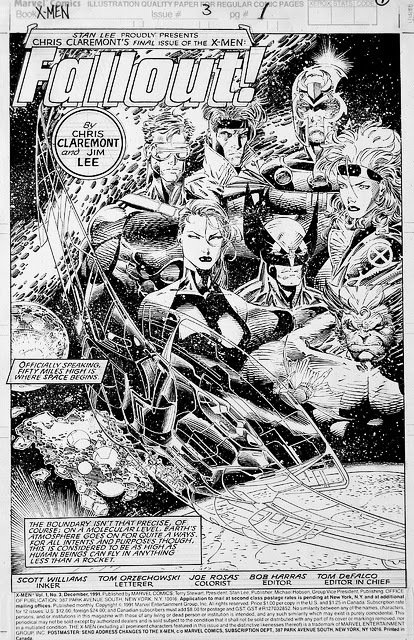 I recall seeing a Whilce Portacio piece that depicted an X-Men team with Scott, Jean, Bobby, Archangel Gambit and Colossus. I imagine there were a few different line-ups proposed in the pre-Image Era. Hey Dougie, I bet there were too! I change my mind enough just thinking about my dream X-lineup, let alone having to do it for real! For some reason though, I do like the idea of Jean and Gambit on the same team.